If nothing else, we now know for sure that server space and bandwidth has gotten cheap. So cheap, in fact, that they can’t give it away fast enough. Amazon just announced their new music digital locker service, appropriately named Amazon Cloud Drive. If you already use Amazon, you get 5Gb of free storage space. And it’s not just storage space, you can actually upload your own personal music files and stream music to your device or desktop. Are there other places where you can upload files for free? Sure, Dropbox.com and Google Docs have offered this kind of solution for a while. Services like these allow you ample space to FTP files to yourself or other people. It prettymuch eliminates the need for USB keys, which always seem to get lost or stolen. Amazon goes one step further by adding a terrific music player and upload app that works on Mac and PC. If you don’t have it already, Amazon automatically downloads and installs Adobe Air, which is free and is useful for apps like TweetDeck. Best of all, it’s incredibly easy and fun, even for people who are fairly low tech. I’m a total nut for tech predictions. Love ’em. Not only does it get me excited about the future of technology, it warms my marketer’s heart. Every new tech channel represents a new way for marketers to communicate with their target audience. And for people to discover brands and solutions that they actually want. Yes, we saw a pretty big year for Apps, thanks to the iTunes store servicing the iPhone and iTouch. But with Android and Kindle and even HP having stores, we’re going to see a big, fast expansion of useful apps. And people will want these apps to synchronize across devices and platforms. What it means for marketers: A lot. Brands that create useful apps will see adoption rates soar. It doesn’t matter if it’s branded. If people need something, they will use it. If it happens to keep your brand top of mind, well, then good for you. Every marketing initiative needs to have some sort of measurable ROI. Without a strong analytic package, you can’t tell what works and what doesn’t. The tools that we use are probably (hopefully) going to get better now that Adobe owns Omniture. Even free packages like Google Analytics are getting better, which pushes paid solutions like WebTrend and Omniture to innovate to remain competitive. Expect to see better tools for measuring Flash. What it means for marketers: Good news for marketers who like numbers. Now, you will have even more numbers. Signs of life are bubbling up again from Redmond. Microsoft took a beating from Google, which has reinvigorated their competitive spirit. Bing is turning out to be a pretty decent search engine, which is encouraging for search marketers. What it means for marketers: Microsoft is serious about making money in search, so they are actively courting search marketers. We’re already seeing them push Google to release new features, which is good for everyone. If you are using search engine marketing (SEM) campaigns, you can expect more options from Bing. And from Google, who will continue to maintain their lead. In recent years, everything has been focused on the desktop. But powerful mobile tools have changed the way we interact with websites. The traditional desktop will survive 2010, but it won’t be the only way people interact with the web. What it means for marketers: It means that every new device — from the Kindle to the television — is now a new channel to communicate with customers. Smart marketers will be putting messages everywhere. Okay, this one is almost a little mean. Like teasing the short fat kid in school for being, well, short and fat. But newspapers are going to slip even more rapidly than they did in 2009. In the end, it’s likely that we’ll end up with a few national papers (like USA Today), a few regional papers (like New York Times), and maybe a few weekly local papers. What it means for marketers: It’s a mixed bag. If you have a good PR team, you can get a story on the wires and have it syndicate to a lot of readers. That’s very encouraging. But with fewer reporters and papers, it’s going to get harder to get some ink. With less print out there, it will get a little more challenging to communicate with older demographics. We’ve been marketing to mobile devices for years now. Some agencies are quite good at it, but sadly, many more are not. Most mobile marketing is pretty lame. This year we’ll see the good agencies roll out marketing campaigns that make full use of mobile devices. Right now, mobile marketing is still rather simple. Look for more sophisticated and personalized applications. What it means to marketers: It means that mobile content and incentives will need to be formatted for multiple screens. Don’t expect users to wait for your massive homepage to load. Everybody loves a good discount. But if you forget your coupon at home, you may wait until the next trip to the store before you make a purchase. That’s a missed opportunity for brands. Many new devices have location-based software, so more marketers will figure out how to use this for offering coupons and incentives at just the right moment….like when they’re in close proximity to a store. What it means for marketers: More sales and happier customers. Also, brick and mortar stores will star to win back customers from online shoppers. Traditional media is slipping fast. That doesn’t mean people don’t need content. People want to know more about the product you sell, but also about how your product compares in the category. Content marketing will mean that your content must be fresh and vital for your target. Set it and forget it? Forget that. Write more content and make sure it’s formatted properly for the channel. What it means for marketers: Make friends with a good copywriter. Try to tap them for ideas on how to update websites and other resources, so that your are providing proactive content for your audience. Over the last few years, social media channels have become an effective way to connect people and products. But as the audience grows and diversifies, Facebook (and other social channels) will offer more mature and measurable ways to talk to targets. Banner ads? Sure, for certain awareness campaigns. But also look for more powerful fan-page types of services that give more flexibility and power to the brand. What it means for marketers: Social media is probably going to get more expensive, but you’ll get more for your dollars. Kindles, iPhones, and the eagerly anticipated Apple tablet will give us new and interesting ways to tell people about our brands. But as the hardware becomes more powerful, it takes longer to figure out how to truly use it effectively. Initially, we just mash up existing technologies with new technologies (look it’s video…and now it’s on an iPhone!). New hardware will give us some immediate and measurable ways to deliver messages. But this year we’re going to peel back another layer to these devices, and discover new applications and opportunities. What it means for marketers: Figure out how your message scales to new hardware before the competition figures it out first. So there you go. 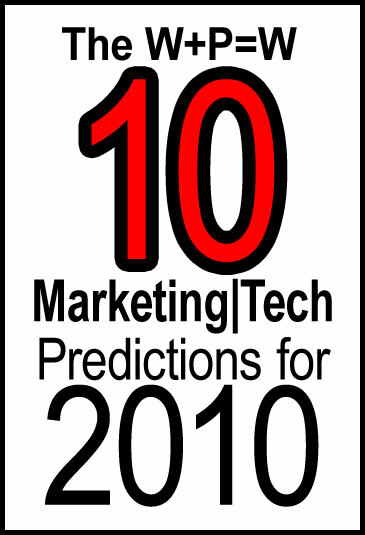 Those are some of the tech trends that I believe will affect marketers in 2010. I’m sure I’ve missed a few things, but now you know what sort of stuff I’ll be working on this year. Did I miss anything? Let me know your thoughts. Interesting article on eBooks and Amazon in USA Today. Forrester Research estimates that domestic consumers will buy 6 million e-readers in 2010, up from 3 million this year. “For the first time in history, consumers are realizing that reading books digitally can be a pleasurable experience,” Forrester analyst Sarah Rotman Epps says. And that means “the sky’s the limit” for sales of e-readers and e-books. There are quite a few similarities between the Kindle and the iPod in terms of fixed pricing. Consumers love the low price of MP3s in Apple’s iTunes Store. So Amazon has been copying that by selling new bestsellers at around $9.99, while the print version is about $25. Publishers are unhappy about this for many reasons, but it’s a trend that’s going to be difficult to prevent. The big rumors are that Apple will eventually release a tablet computer that may even rival the reading quality of these ebook readers. If that happens, there’s going to be a pricing war to sell the cheapest books, magazines, and other content for ereaders. After all, once someone commits to one of these online stores (like iTunes), it’s probably difficult to get them to leave. I do a lot of shopping on Amazon. It’s unlikely that I’d leave the Amazon experience to shop in the Sony store. If I had a Nook, I’d shop the BN.com online store, since it has a really terrific selection of books. And I’d definitely shop on iTunes, since I already buy most of my music there. Love Words + Pictures = Web, but don’t want to sit in front of your computer monitor anymore? Well, now you can get your W+P=W beamed magically to your Kindle! Yes, that’s right ebook fans. You can now carry me in your backpack, your purse or even curl up with me in bed. Read about ereading on your favorite ereader! But that’s not all, you’ll get geeky blog posts about emarketing, interactive content, and maybe even comic books. So what are you waiting for? 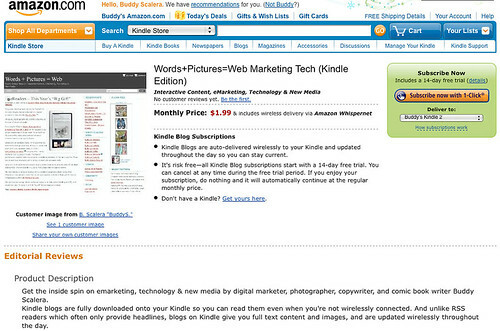 Go check out the Words+Pictures=Web Marketing Tech Kindle Edition and impress your friends with your high tech brainy marketing knowledge. As I begin to assemble my 2010 tech predictions (a silly, but fun tradition among bloggers and other media types), I find myself stopping frequently to shop. Well, not shop exactly, more like check Amazon to see if a product exists. Y’see Amazon has grown so all-encompassing that it’s become something of a reality check for products. You can order almost any product from Amazon. Since Amazon runs something of an eBay-like reseller area, they can sell things that they don’t even stock in their warehouse. I actually sell a few things on Amazon, including back issues of comics and my books. Amazon has a secure ecommerce network, lots of customers, and a strong trusted brand name. With a greater push for digital healthcare, many more people will be shopping for their prescriptions online. Since so many traditional pharmacies have diverse retail stores (or anchor to retail locations), consumers are already comfortable with picking up prescriptions while they shop for other products. WalMart, CVS, and other stores have strong retail and online locations that sell prescriptions. If you have an acute condition that requires an immediate prescription, shopping online may not be the best option. But for chronic conditions that require a regularly updated prescription, reordering from an online pharmacy makes sense. So how long before you can buy your prescriptions on Amazon? Probably not long.